Jack's Creation is a mix of brownie, sprinkles and caramel. Stop in any Cold Stone Creamery today from 5 to 8 p.m. to get some free ice cream in exchange for a donation to the local chapter of the Make-A-Wish Foundation. Cold Stone Creamery’s monthlong fundraiser is coming to an end with the World’s Largest Ice Cream Social in honor of five-year-old Make-A-Wish kid Jack. Cold Stone Creamery Tastemaker Ray Karam partnered with Jack to create his own ice cream creation to celebrate the benefit. 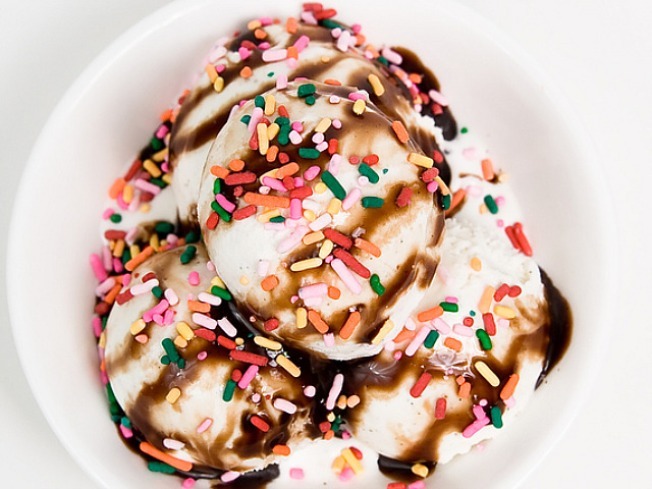 A three-ounce portion of Jack’s Creation, sweet cream ice cream mixed with brownie bits, sprinkles and caramel, will be the free treat offered today. Cold Stone Creamery has supported the Make-A-Wish Foundation since 2002 and has raised $3.2 million in donations. To find the Cold Stone location nearest you, go here.